History and I aren't the best of friends. Maybe because I grew up in the time of history being an old teacher reading a dry, boring text book.. picture Charlie Brown listening to his teacher. All I remember is whaaaa, waaa, wuuu, wuu, wa! I so want to make history fun for my kids and quite frankly myself. If it is boring I am pretty sure I will skip it. Just being honest. When time gets busy, the most boring things go first. 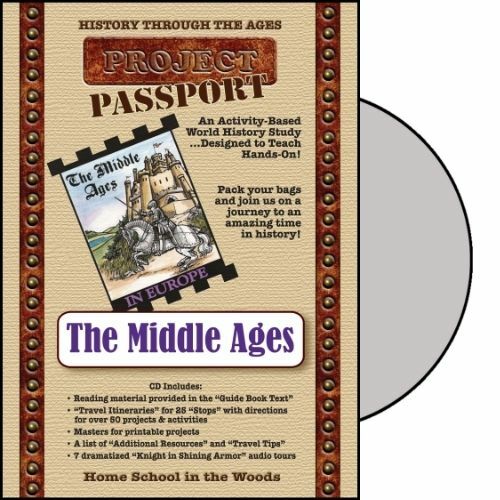 Home School in the Woods has a outstanding history program called Project Passport World History Study: Middle Ages. There is also Ancient Egypt, and Renaissance and Reformation. This product is a digital download, or you can purchase it on CD. Both Mac and PC compatible. So much more than lapbooking! This History program gets you right in the thick of learning, and having fun while doing it. Middle Ages has 25 Stops along our journey. You move through each Stop at different paces. The first few take a little longer as you get your binder and time line set up. You will be printing quite a bit the first few stops so make sure to get a new ink cartridge before you start! Also be sure to check out the introduction, travel trips and additional resources to find out a wealth of information before you get started. There is a little preplanning involved and this is a great place to find some of those things.. like an ink cartridge! Stop #1 took us several days. Just so you don't get scared off. We had a lot to do with printing out time line figures, passport, a medieval newspaper, and more. You are basically getting prepped for the other starts so think of it as getting all of your luggage and paperwork in order before you travel. Since we are more in a summer mode right now, we were able to take a little more time when we sat down to study the Middle Ages. In a typical school day I don't think we would have got nearly as much done. I love that you can easily stop and start based on what your schedule is. You continue to lay a 'foundation' through Stop #3. Loads of fun making postcards, maps, and putting the historical figures on our timeline. We chose to just do one timeline rather than 3, for ease on my printer. I used this with my 7, 10 and 13 year old together. We also just had one medieval newspaper and took turns writing articles (like a real newspaper). I did have the kids do their own postcards and maps though and we kept them all in their 3 ring notebook. I suggest you get one for each child to keep all of their supplies. There are many papers in this program and you will want a way to secure everything. The guide uses icons to let you know when their is a sample picture you can look at, when to use your newspaper, and snapshot moments. It is very well organized and once you get all of the foundations down you really can work through it efficiently. I love that there are crafts for several of the stops. My kids love the crafts! I looked ahead so that I could find some of the supplies, like Marzipan, and green felt. Easy to find things that if you look ahead, can be prepared for. Each stop has a Guide Book Text where you can read about your stop, set the stage so to speak for the upcoming projects. I love that I don't have to research anything, simply read it to the kids. After we do the Guide Book we look over the Travel Itinerary which is where the meat of the study is. 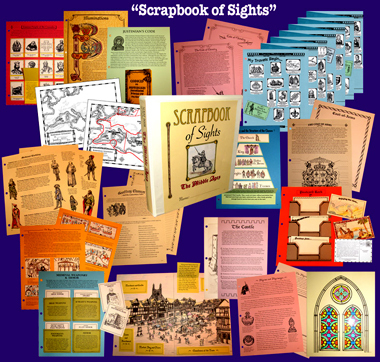 All of our lap books, newspaper articles, crafts, lessons are here. This is a good section to print out and put in your teacher binder. It also tells you which things you need to print and use for this Stop. There are links for each print out you need and they are labeled to make it easy to find them. Some of the Stops have an audio portion that you can listen to. These are really fun and add another dimension to learning! Great to listen to and you can download them and put them on your mp3 player. Absolutely outstanding program! The kids and I loved it. We will complete this study and then be back for more from Home School in the Woods. It works for us on so many levels and with a variety of ages. I can't ask for anything more! Get a sample download of one stop in the Middle Ages HERE and try it for yourself. 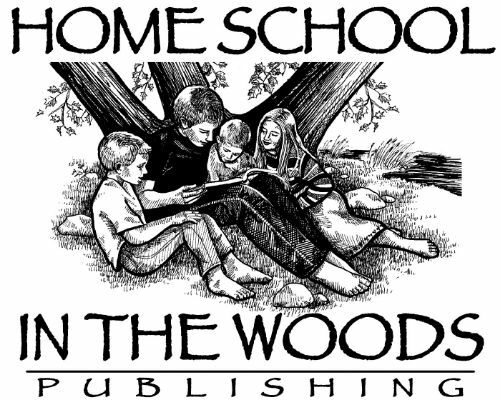 Check out Home School in the Woods on these social media sites. Don't just take my word for it, check out what my Review Crew peeps thought about Home School in the Woods as well by clicking on the banner below.